A rag doll is a children's toy. It is a cloth figure of a doll. They are traditionally home-made from (and stuffed with) spare scraps of material. They are one of the oldest children's toys in existence. 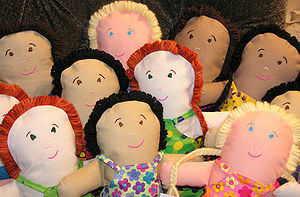 Today, many rag dolls are commercially produced to look like the original home-made dolls. These dolls usually have simple features, soft cloth bodies, and patchwork clothing. This page was last changed on 9 July 2018, at 15:45.